Which Do We Need And Why? What is the difference between Asset Management and Configuration Management? Are these two different processes? Do we need different tools? These are questions we often get from our customers at Flycast Partners and we can help you sort through this tangled mess. While these may seem like two different processes, both are actually components of the same process as defined in ITILv3 as Service Asset and Configuration Management. So let’s start with a high-level view. 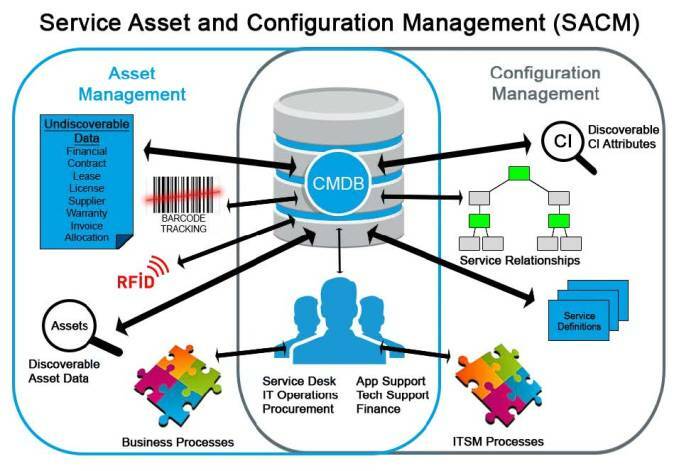 As can be seen, at the core of both Asset and Configuration Management is the Configuration Management Database or CMDB. The database contains all of the data needed to do both Asset and Configuration Management. The data stored in the database can be used by a variety of different organizations as needed to perform both Business and IT Service Management processes. Asset Management is primarily concerned with managing, tracking, and controlling the life-cycle of the asset from the point of acquisition to disposal. This includes tracking data that is non-discoverable but needed from a business perspective. Asset-specific data can also be collected about each asset through a variety of different means such as scanning barcodes, RFID tags, or automated discovery tools. This allows the organizations using this data to make business decisions, evaluate software license compliance, analyze the return on investments, determine the utilization of assets, and optimize the investment made in these assets. Asset Management can track both IT and non-IT assets that are needed to support IT Services. This asset related information can also be used by the Service Desk and IT Support Teams to support ITSM processes like Incident and Problem Management, Request Fulfillment, and to some extent Change Management. Configuration Management is concerned with tracking some of these assets as Configuration Items (CI’s). Specifically, the assets that are used to make up a Service. Configuration Management ensures that the CI’s required to deliver the service are properly controlled and that accurate and reliable information is available when it is needed. This information is used to make the decisions needed to support efficient and effective Service Management processes for optimizing service delivery and support. This means not only relying on asset data that is resident in the CMDB but combining that with data that is specific to Service Management (incidents, problems, changes) as well data that is discoverable through the use of automated discovery tools. This includes data on the current health and status of the CI’s, discoverable attributes or changes to attributes, and the relationships between CI’s that comprise the service. So where do you begin? Typically, you already have some level of discovery tools in place to identify some initial data on your assets. For many organizations, populating this asset data into the CMDB allows them to focus on identifying and managing the assets at a basic level that can be of immediate benefit to the Service Desk. The asset data collected can then be used as a starting point for full-Service Asset Configuration Management. As the People, Process and use of Technology evolve, comprehensive and accurate information about these assets can be collected. Relationships are needed to define services that can be established to help your organization begin to build a more robust CMDB. This will support not only Incident and Request Management but other ITSM processes such as Change Management, Release Management, Availability and Capacity Management. come across a blog that’s both educative and entertaining, and let me tell you, you have hit the nail on the head.